"Nobody doesn't like this," is what the gold-toothed man told me. He had just chugged an entire bottle of kymyz, lightly fermented horse milk. All of us had been standing in a circle eager to sample this unusual beverage and had immediately, upon taking a sip, either frowned, gagged or retched [editor's note, kymyz is wonderful and delicious]. It had layers of flavor, each of them completely indescribable and equally revolting. My brother had purchased it from a woman by the side of the road selling it out of a plastic bucket. We applauded the gold-toothed man who was now my hero. He had the fortitude to survive in this crazy country. How I met my new hero is a tale full of joy and woe in equal measure, of delicious cuisine and food poisoning, of policemen in funny hats and nomadic hospitality. For this week's column I spent 10 days in Kyrgyzstan, driving around in a rental car and camping. I'd been hearing more and more about this small Central Asian republic for the past year. Other travelers spoke about its incomparable natural beauty. It has a tentative historical connection to Turkey, as Turks claim descent from the same nomadic tribes and traditions that are still alive in Kyrgyzstan today. Although Russian is widely spoken, the Kyrgyz and Turkish languages are in the same wider language family. The country is loaded with old Soviet Russia architecture and the Silk Road caravanserais. As the first country to gain independence from the Soviet Union during its collapse, the Kyrgyz are proud of their heritage. As a bonus, it's also cheap to travel around this country, and I really wanted to see it. So some friends and I planned a trip from Bishkek to the ends of Issyk Kul, the huge warm lake to the east, and everything in between. We hiked, swam and stayed in dormitories. We gamboled on the prairie steppe and climbed up craggy mountains. What follows is my travel journal from our 10 days of roaming in the home of some of the last the Central Asian nomads. Kyrgyzstan's capitol gives the overwhelming impression of scrap trash piled in a grid. Construction plagues every other building, with building wrap flapping in the wind. Very difficult to navigate, its square matrix of avenues stretches for mile upon dusty mile. During our midnight drive from the airport to Tunduk Hostel some 30 kilometers away, our driver pointed out all the features of the city: The National Museum, Bishkek Big Ben clock tower, the White House and the Statue of Lenin. Each was either a stack of massive grey cubes, or an empty park. It's clear nobody comes to Bishkek for its historic old town. We were stuck there three days waiting for our arranged rental car to become available. In the meantime, we tried to explore and mostly failed, since the city's so large. Our hosts at Tunduk, I cannot recommend this place enough, took us out to the rough town center, Chuy Prospect. At one end was Sum, a supermarket with an ostentatious series of fountains and horse statues, and at the other was our destination, Chebak Pub. The food all tasted like fried gelatin, but at least they had a live band playing Top 40 covers, plus a healthy dose of Russian Shanson. Food was neither incredible nor ghastly. Our first meal was a tasty bowl of Korean Bi Bim Bap at Cafe Koreana. During the Korean War, the Soviet Union split up ethnic Koreans living in the Soviet Union, and resettled them in other soviet Central Asian republics. Our hostel, just next to the Korean Embassy, had a number of good places to eat nearby. My $5 dish of rice, vegetables and pickled things was simultaneously the most expensive and best thing I ate in the country. Another Korean BBQ place burned me, however, when I asked for something like a kebab, and they brought me stir-fried dog meat. In the middle of a big open nowhere stands a 45-meter (150-foot) tall brick tower, the reconstructed remnants of an old Silk Road minaret. Burana was once a prosperous town, complete with a mosque complex, housing for traders and walls, but all of it has fallen down over the centuries. Even the minaret has lost half its original height. We hired a driver to take us the 80 kilometers there for 2,000 som ($30) and wait for us while we explored. To climb the tower, you go up a twisty metal staircase on the outside, and then squeeze through a narrow lightless tunnel inside. Atop the tower, you get a panorama of the great big nowhere and the stone monuments nearby. The early Turkic people who lived in and around what is now Kyrgyzstan put up funeral monuments, stones the size of graves, carved to resemble great warriors. They look at bit like giant matryoshka dolls, staring out silently across the plateau. Some look noble, while others look quite awkward. All of them hint at a history buried by years of neglect. This is what we'd all been excited about. We began a long trek across the country to the lake, gaping stupidly at the mountains on either side of the highway. We decided to take the Southern route, because while the Northern road has more touristic stops, we were keen to avoid tourist traps, trashy beaches and cops who wanted bribes. The south road also offered the best open empty views. Kyrgyzstan's highways are where the country begins to make sense. Besides the gorgeous natural scenery, we got a look at the weft of common life here. We stopped at a town for groceries. The locals shouted with joy to greet us and sold us glorious "xashan," soft bread buns stuffed with meat and onions. We saw young men riding horses without saddles on plains and highways, either driving herds of sheep or doing the most mundane of errands. We saw a number of strange cemeteries of hand-built tombs built either to resemble a birdcage or the Taj Mahal. We saw our first yurt camps, white squat domes covered in traditional designs. We observed what we dubbed the Kyrgyz national activity, which was parking a car and then getting a bunch of people to stand around it. When we asked locals where we could camp, they seemed almost confused by the question. Camp wherever you want, they said. Of course you can camp there. Nomad culture lends a broad acceptance of using anywhere in the empty expanse of the steppe for a night's rest. Our first night was spent in a pasture with a silky river flowing through it, loaded with gray glacial silt. Our next was spent on the shores of the vast lake itself. Issyk Kul is the second-highest alpine lake in the world and does not freeze. I received competing answers for why that was from the locals, either it was too salty or there was geothermal activity down below, or the glacial runoff ensures warm water stayed on top. When you jump into the lake's slate-blue waters, it is cold on the surface, but gently warm near your toes. Our happiest moments on the trip were spent on the shores, cooking things on the fire and looking at the tips of the giant snowy mountains across the lake's azure surface. After a few days of camping on the lake we were ready to hit Karakol, an old Russian Orthodox outpost. It felt rural, with handmade gates and unpaved roads. We popped into the Community Based Tourism (CBT) office to figure out what's up. Across most of Kyrgyzstan's towns, you can find local CBT offices for tours, tips and accommodation. Founded in 2004, it connects travelers to local families and businesses, both to offer assistance to locals and to help tourists get a more authentic connection to the culture. We stepped into one in Karakol for the first time, and it was the easiest time I've had booking and learning about things, ever. The CBT office in Karakol set us up with Guest House Nur. We stayed there for two nights, chatting as best we could with the family, despite a significant language barrier. And at only 800 som for a bed and breakfast, it was easy on the wallet. The CBT people also sent us up to Jeti Oguz, the "Seven Bulls," seven hills of rippled red stone jutting out from the pine forest, for a day hike. Some incomprehensible quirk of geology spat them out from the emptiness of the steppe crust a trillion years ago. Then locals dubbed the seven hills "bulls" because, obviously, a red boulder the size of a small mountain looks exactly like a bull. On the drive out from Karakol, we stopped by the side of the road for some eagle time. 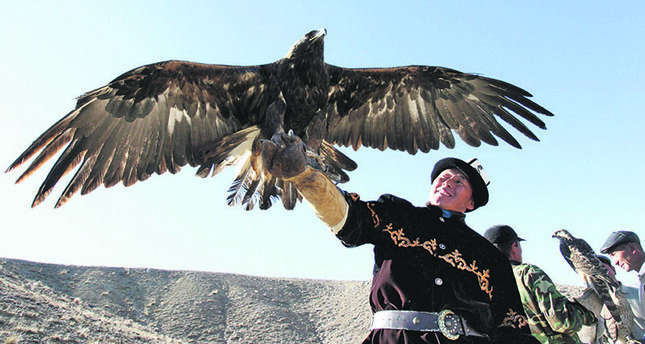 Kyrgyz use golden eagles and falcons to hunt. I have no idea how it works. I wanted to ask our new eagle handler friends about it, but they kept putting eagles on me and demanding money to take pictures, so we ran away. Past the Seven Bulls is the town of Broken Heart, where we met my hero, offering pictures from atop his horse. Driven by promises of a waterfall in the mountains, we went 14 kilometers up a dirt road through a rainy pine forest. Soon the forest opened into a wide pasture, a "jailoo," and we could see a plethora of traditional yurts dotting the mountainside. Kyrgyz kids ran around and played with horses and bows. It was summer camp. Up here, wind rippled the grasses and horses' manes. Sunlight lanced across the golden green pastures and drew shadows across the river. We marveled that the locals just considered it a normal thing to hang out in the summers in such a beautiful place. Walking down the trail, we saw a group of men on horses near a new Jeep stuck deep in the mud by the banks of the river. Clearly they were about to attempt to pull it out. One man stood on the roof of the Jeep, smoking a cigarette, when suddenly he said something and all the horsemen turned and looked at us. We all laughed at the same time, caught in mutual appreciation. Back at the parking lot, my golden-toothed friend leaned onto the car window and got a picture with us. The real beauty of Kyrgyzstan isn't just the monuments, mountains, "jailoos" (summer pastures) or dormitories but the warmth of its smiling people.